Many of our competitors love to pride themselves with claims of having the best products, and that everyone else is either lying or cheating the customer. Do these same folks offer proof? No, they simply tell you how good their product is and how bad their competitors are. They push you top buy from them, because they’re the experts. These people think we all fell off the apple cart on the way to town. One trick the loud mouths use is comparing different products that are comprised of different parts or do different things. Under their very controlled environment, they glaze over the actual specs and don’t mention missing information. Next thing you know, they are the heroes with your life’s solutions. We all like to call this snake oil and a bag of garbage. 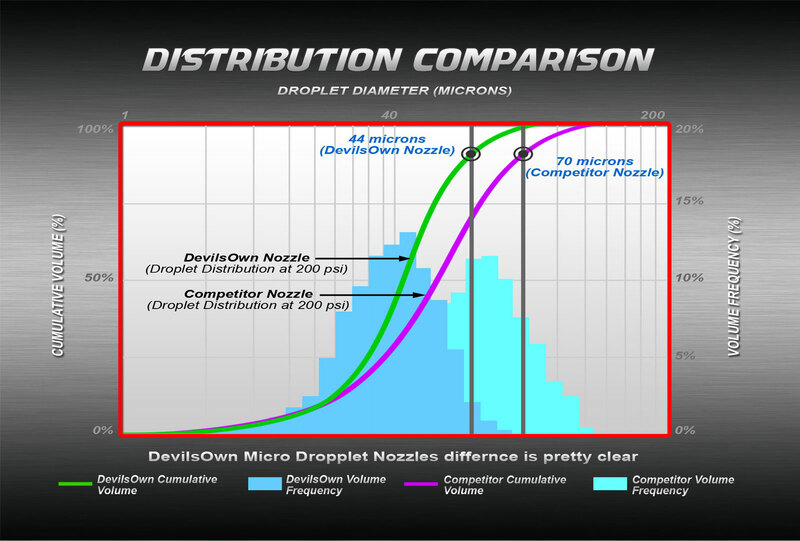 A good example of this is: DevilsOwn© being compared with another system when the DevilsOwn© product is clearly missing the check valve; which, comes prepackaged in the DevilsOwn© kit. The other system has an optional solenoid, not included in the kit. Gee, I wonder which system will perform better. Give me a break, these folks are not only crooked, they are incompetent and think you all can’t see through their parlor tricks. The ONLY variable in this testing shown below was swapping nozzles for the equivalent size of the competition. This means both nozzles were the same size, same cc-mil/min, same fluid, same temps, basically the equivalent product built by someone else. We had a stroke of luck and a university flowed a total of 35 nozzles for us. Some of our competition say their nozzles provide 10 microns. What they don’t tell you is at what pressure? Just to show what this actually requires, we had them run the pressure up to test how much pressure 10 microns really takes. They had to use a lot more pressure, over “1000 psi”, to achieve the claimed 10 microns. Talk about truth in advertising. Some of these same geniuses will tell you to flip the nozzles up and compare the time it takes for droplets to fall or how far vertical the droplets spray. Nozzle cone pattern does have something to do with that, in a limited way. In products the pattern varies from 60 to 85 degrees. Sounds like funk, but I think free access to a very expensive machine is going to have a better result than playing in the water. Using a laser partical counter, we now know the number of droplets in a sample at a given size. So we aren’t claiming DevilsOwn© performs better, we’re proving it. Tommy Johnson Jr NHRA Drag racer and host of Performance Tv "They really do have the best nozzles in the industry"